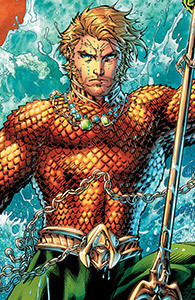 He’s the King of the Seven Seas and absolutely deserving of your respect, and quite possibly, your unwavering fealty. Why? Because “talking to fish” is only 1% of the ‘coolness factor’ permanently permeating the wrongly ridiculed Aquaman. And yes, talking to fish IS cool because that extends to convincing 300,000-pound Blue Wales to launch themselves into your above-ground pool until you stop mixing your recyclables with regular trash. KNOCK IT OFF! Anyway, barring any internal political strife, Aquaman holds sway over an advanced civilization that inhabits 71% of the Earth’s surface, a civilization with one hell of a formidable military. And beyond his fluency in ‘fish-speak,’ Aquaman’s body is nearly indestructible and his strength superhuman; this is what happens when a body is beset by thousands of pounds of pressure per square inch in deep, inhospitable depths. Basically, I’m telling you Aquaman is the starfish’s pajamas, and you need to pledge your allegiance to the undersea emperor by purchasing one of our many, Atlantis-approved selections of Aquaman merchandise. Because wearing an Aquaman t-shirt might save your life when Aquaman’s tolerance dissipates and he invades countries dumping broken Smart Phones and Ikea furniture into the Atlantic Ocean. Available Exclusively through Superherostuff, these Aquaman hats are the perfect, stylish, head-focused homages to Aquaman and his newer look conceived through a filter of dark realism hastily displayed in Batman v Superman: Dawn of Justice. Available as a fitted, flat-billed 5950, or a curved and sized 3930, these high-quality New Era hats feature raised, faux-leather scalemail and bright yellow, embroidered Aquaman symbols. If you want to garner sympathy from your shark skull-wearing, Atlantean executioner, I suggest wearing one of these beauties to elicit a quick, merciful death by hyper-sharp swordfish. Our series of Aquaman Symbol Orange hats – compliments of high-quality hat maker New Era – feature bright orange bodies and green colored brims. 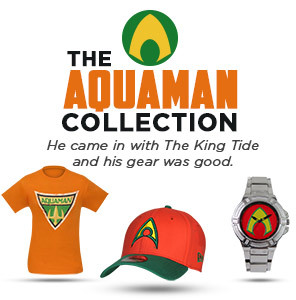 Available in the fitted and flat-billed 59Fifty, the sized and curved 39Thirty, and the flat-billed 9Fifty with snap-back closure, these beaming Aquaman hats feature raised and embroidered Aquaman symbols framed in green trim. Again, they may display a loyalty to your new water-breathing overlords and perhaps grant you a lifetime of shoveling Sperm Whale waste. Trust me, it's much better than a guaranteed death by arm-wrestling forgotten, Chthonic leviathans.